Mud Pond Carry, all 1.8 miles of it, may be the most infamous section of the trail. 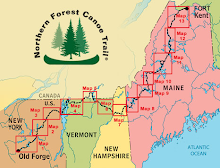 The NFCT map says it is not an official part of the trail and suggests a $100+ portage by automobile. Had thought of taking the portage, but Ed Raymond talked me out of it (the teenage kids attending camp do it, and you said that as a purist, you never accept a ride... tough guy!). As mentioned earlier, if multiple trips are required the actual distance to be covered can be 3x or 5x. The carry starts with the small section of mud shown here and then gets more challenging. Groups moving large canoes and lots more equipment than mine can take a full day to get through. The Carry is made up of a stream running through varied conditions, mostly muddy. And, yes, the bugs are out. My strategy is to continuously move all my gear through in short sections. That means having time to walk without a load while preparing for the next section of moving the boat and gear. It takes me two trips to move everything, boat and gear. Strategy successful, I arrive tired and muddy at the other end in a respectable 3 hours. Time to wash off! In goes the boat to Mud Pond only to find.... it is a Mud Pond! No way to wash off here, so continue down the small and fun Mud Brook and into Chamberlain Lake where a full wash-up is in order. Stopped at the Lost Spring Campsite, prepared and ate dinner, then continued paddling.